Our strategy for Angry Birds Seasons The Pig Days Level 2-1 is to send Stella directly on the bottom button. Then repeat the same for the middle button. The score in the video below is 50,680. Note: This level marks Learn Code Day. Bonus! Our The Pig Days level 2-1 Mighty Eagle walkthrough is live as well! My strategy was the same as the video — just keep repeating. I suspect that the scores for this level will be very closely clustered with many nesters within 10 to 100 points of one another. I don’t see how ot makes any difference, but I seemed to get slightly higher scores when I launched the 2nd bird quickly after the 1st although that could just be my imagination. I agree @jwgardenwiz. I matched but haven’t been able to top your high score. Oddly, I now show up on this page as the high score. I bet the next 50,820 will depose me. I would prefer the first person – you – with the high score should retain the title. I got the 3 stars but can only get to 44,000+. Again it’s saying that the level opens in 1 DAY!!!! it’s becoming really frustrating! What’s happening to Seasons?? 2 times already this and the fact I can’t buy the 30 levels extra in NBA!! I think I had to wait few hours. I agree w/you about the extra NBA games. I have them on my phone but on the iPad they are locked & want me to buy. I have also noticed in the NBA games a couple of times I actually made contact & yet it didn’t count. Now that’s frustrating. Oh, and AB Transformers is out. Didn’t show up in the app search, but it’s available through an in-app ad. There’s also a few extra points if you aim the second Stella a little low and hit the cement first, then she’ll go up to hit the red ball ;-) Finally got the 50820 score ;-) It’s so weird how the red plank doesn’t always open up. @dmsral – I wonder if higher scores are possible then with the over 1800…on my 50820 score I only got 1740 or 50 (forgot)? Had the 1850 several times, but even when the next shot does break the bridge getting high scores is by no means certain. On the occasions I’ve got he 1850 the bird went over the red knob and hit the junction of the wood and stone and then I inflated. I got 1880 now again but cannot tell the difference of shot to 1850 in hitting wood, stone, knob. Except maybe that the top corner was touched the exact right way, because Stella seemed to be stopped/braked for a split-split-second. Red bridge again didn’t brake then. As well as hitting the stone at the same time as the wood to get an extra 100 points with your first shot, the same technique with the second shot can add an extra 60 points. That’s a much harder shot, however. Now the trick is to combine both! Oops! I meant my high of 50830…not 50860, sorry! That little whine brought me the luck I needed and got me through this, thank you! Just an observation while I was trying to get that 1850, was to activate Stella’s bubbles as soon as I hit the stone block. Her bubble would bump the toggle switch as she rose, to drop the boulder. First hit the bottom red ball, then the top red ball and finally the middle ball. This resulted in 42,560. How can you make that the red block breaks? My stone always rolls over it and I only get 38k. What has worked for me is hitting the lower red ball straight on. The red bridge then always opens when you hit the middle red ball, even if not straight on. That the bridge remains intact so often must be bad coding. @wrm39 — I agree with you totally! 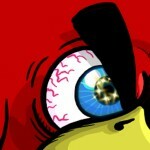 What was Rovio thinking? This level does nothing to help players understand coding. The level appears to show a binary system, where the choice of input for each element is 0 or 1, not 0+ an infinite choice of fractions between 0 and 1, and the same for 1. A program that is properly written, with all variable appropriately initialized, should be totally deterministic. Random results should require the deliberate introduction of random variables, which we know Rovio has done. But on this level? Come on Rovo! 1 + 1 = 2, not 2 except when it sometimes = 2.333! Maybe they were coding on an old pentium processor? @Sparty83 — Thanks for the interesting article! I’d never heard about that. But I doubt that’s the problem with this level (from a programmer’s point of view). I wonder if the rise of computing on mobile devices, which might not be deterministic, is destroying the beauty of programming on a totally deterministic computer? You used to know that if the answer you got from your code was wrong, that you’d made a programming mistake. What now? I find that if I hit both red buttons dead on the red bridge will open each time. However, I’ve only achieved a 50,820 score, not 50,830. Apparently I was not hitting the lowest button as dead on as I thought. Have now achieved 50,830 with the additional 10 points occuring with the lowest button. A few additional points may be attained with micro adjustments in the aim. Hm. I’m not getting this level on PC. Not even seeing the “Opens in 1 day” placeholder. The whole second page is Coming Soon. My system date is fine. Am I missing something obvious again? @kelani, I don’t know if it’s just on PC platforms, but on my Android tablet I saw the Opens in 1 Day notice. @kelani and SweetP I’m getting the same (no)thing as Kelani, not even the opening countdown. Oops, I meant @sweetp and to say that I use a Mac. @Kelani and @snoid, as of today, my tablet shows “15 Days” under the padlock. @SweetP You either have a different issue, or that next level is coming in 15 days for some reason. @Snoid and I don’t even have this Learn Code Day level, or anything else on Page 2. The ‘Coming Soon’ screen is entirely blank. After staring at a similar Coming Soon screen in Short Fuse for seven months, I suspect this means those levels aren’t available for PC yet. So on some future mystery date, months from now, I expect an update will appear and the levels will be unlocked, albeit waaaay past their expiration date. @Snoid , @OtherPCusers, I guess I’ll open another ticket with Rovio (third this week! ), and reply here or in the forums when I hear back. @kelani Maybe you should check again to see if the level has shown up. There are five players in the top 100 on this level who list their platform as PC (@bryonjames @mtj1517 @spongebob @frankie1980 and @momfreedom). It’s possible that all of them may be using a different platform now, but it doesn’t seem very likely. If any of them would like to help Kelani out, and she certainly deserves it, please let her know. I didn’t find any Mac users listed, and my second page still just says “Coming Soon” without even the outlines of the future levels, so I’m resigned to waiting to find out just how long “soon” will be this time. @amslimfordy Do you know anything on this subject? Unfortunately the new Pig Day levels require a new update in order to be included. The levels will become available as soon as we release the latest update to PC as well. We apologize for the inconvenience! I guess that must apply to Mac as well. If I’d remembered that was your platform, I would have asked in the support request. @Kelani, as I would have expected, today it says “14 Days” under the padlock. So, I guess it must be a PC-thing, that you’re not seeing what I see…IDK. @SweetP Right, I mentioned above you’re seeing something different. You have three-starred the level already. We don’t have it, or any levels on page 2. Rovio’s answer is two posts above this one. The levels don’t exist for PC/Mac yet. No updates on PC, I play on other platforms as well, PC is my preferred. @kelani I think that I even made that gender mistake another time. I was going to check before I posted my last comment, but I had to leave the house in a hurry. Sorry about that. So there must be a lot of people using more than one platform. I could use my phone, but I like the big screen. I suspect that the Mac update will come out at about the same time as the one for PC; they usually do. My primary platform is PC, because that is what I grew up on. But since I bought an IPad several years ago I play both PC and IPad. Each platform has subtle differences. But the IPad has Mighty Eagle which I enjoy. It isn’t available for me yet on PC. I got an Android tablet (Dell Venue) this past spring and just decided to download Seasons to play the NBA levels and the exclusive levels that aren’t on the PC. I play Angry Birds on the PC almost exclusively. I just find it’s much more fun in my opinion. Do you have any white cloud that shows open? Mine still shows 5 days but I am able to play at least 45 games. More are coming. At first I didn’t realize that anything was there. And I still haven’t gotten the red bridge to drop. I have tried all the suggestions here & I hit the red knobs but never once has the bridge dropped. My highest score is still 44,420. Hey! what do you know? The blind squirrel found another nut!! No clue what makes one score different from the next here. @Pauliboy — Congrats on the high score! There seem to be some contradictory strats floating around above. Could you please give the details of how you got your score? It sounds like you disagree with the need to hit the red buttons straight on, but instead hit a little above and hit the junction of the wood and stone at the same time??? I haven’t even been able to get the 50820, so any help appreciated. Thanks! @mvnla2 this is how I got my score, but it’s no longer the high score. First shot aim at the lowest junction where stone meets wood. If you don’t score at least 1850 then reset. In practice, once I found the right spot, I was getting a score like that only once every several minutes. When you’ve got the 1850+, then try the same with the second shot to the middle. That’s a 50/50 shot as to whether the stone braks through the red bridge and usually gives scores anywhere from 50720 – 50860, except once when I got 50990 and then quit after having wasted more time than is healthy flinging Stellae. Or whatever the plural of Stella is. I presume that @larry422 achieved the now high score using 3 birds and the mighty eagle exploit. There was a discussion about this on the walkthrough page for 1-12 (Hobbit day). @mvnla2 I would add that you should be able to boost your score to 50830 with the video strategy. You need 1750 after the first shot and then there’s a random luck factor element with the second as to whether you score anywhere between 50620 and 50830, providing the red bridge breaks. Yes, aiming above. Those extra points seem to come from hitting the stone. Whether it’s at the same time, or just before, hitting the wood is impossible for me to say. I aim high to what looks like it hits the stone but I suppose it is hitting the wood too as @pauliboy said. I do not activate Stella but she bubbles up on her own. I have aimed at this same spot too many times to count and have gotten the 1850 with it about 20 times…then,either the bridge doesn’t open or the score is 50700 something most of the time? It just seems pretty random but each time I have got the 1850 the trajectory is always the same so it is repeatable to some degree. Again, I did not get my high score of 50830 with an 1850 first shot start but with a normal 1750, so…this level is just very annoyingly random and not fun IMO. Just managed to creep up to 50710, and actually got the 1850 for first shot (first time for that also). First shot was a little high, as described by @dmsral and others above. For me it happened when the shot was a little high and the pink bird inflate a little outside the stone barriers. Don’t know if it’s repeatable. Thanks @jonstad the scores have been removed. @mkjvanh I removed your score as well. Don’t enter glitched scores on the leaderboard. @sal9 No, I wasn’t sure score was legal and am glad pulled.. Since I don’t have pre non- glitch score is there a way to check records for what it should be? Just enter your best “normal” score. This level is pretty straight forward. The difference in points appears to have to do with the boulder as it rolls. Sometimes you get more points, sometimes you get less. Internet connection works, also there was the NBA update on my device. Yesterday I saw only time to unlock this level and after 10 am (in my time zone) there was only written “23 h” in the place of Columbus Day icon. Now there’s the same problem with this level. Does anybody have the same situation? @admins please can you reset the allowable high score. I have scored 51500 and it’s easily repeatable. 1st bird to bottom button to create stone bridge. Second bird to middle button to release stone which, if it breaks red bridge and drops down cleans up all the available bonus points for 51,500. But I can’t post that. I expect higher scores will follow. This is since the Tropigal Paradise update which seems to be allowing higher cores in other levels. Returning 9 months later to this level and scoring higher than previously in very repetitive manner. To me 52k top score looks unattainable, but lucky glitch can explain it. @juslas It IS unattainable. This is a very consistent level and there are no lucky glitches. Kingbomb’s top scores are likely fake, I already explained why earlier and flagged his scores but nothing has been done about it yet. I hesitate to flag the scores, because I have no clue when clitches at ok and when not. Self destruct levels are sometimes fixed on later updates, for example. But I flag the score, too. Would be nice to have the top (shared) score. I can repeat this comment in all the games of Pig Days. During my revisit the scores are definitive higher than they were when the games just came out. @admins is there any way to inform all our users? @bernersenn Hunnybunny started a forum topic, there are a number of levels where there are more points available. Feel free to contribute to the list! I have just about given up on getting the red plank to fall. I can get 2150 and higher on the first hit and get the second hit but it does not open. It’s been 3 days I’ve started on this one and I’ve spent hours which is ridiculous. I’ve got all the AB games & never had this much problem especially after viewing the walkthrough. Frustrated. @mvnla2 good observation regarding 1+1, but in floating point operations 1 =1 but 3 does not equal 3.0000000000000000. I believe based on scores over the last couple of years that this is a level that actually got harder during an update,that red bridge never breaks leaving you with a bottom-top-middle approach that only results in a score of 44 and change. @admins I believe that the video strategy above will no longer yield 3-star scores. The best I could do is 39K using the bottom-middle fling order. Others have noted this as well (see the 3 previous posts above mine). This is probably yet another level where the average can no longer be obtained. @bernersenn, could you look into this and upload another video? Good luck in getting 3 stars. You’ll probably have to change the threshold and 3-star scores. @bernersenn I think the 3-star score at 42K is probably correct but I can’t confirm this. I’ve tried many, many times and I consistantly get around 44K with three birds (bottom, top, middle) and 38K with two birds(bottom, middle), There doesn’t seem to be anything between those scores. I think you guys are right. I will put this on my todo list. Can’t promise that it will be cleared soon. @bernersenn Add me to the list of those whose red trapdoors will not open. and if there’s a list add me and @Gumby to it! @Comex666 @Asher , can we get your opinions on this level? It would be very helpful to those of still trying to better our scores? @kathy I thought I hit the reply button, but must not have. See my comment below. I asked @comex666 to create a new video for us. This video replaces the original video. Thank you @comex666 for the updated video! On the current version of Seasons the best I can manage is 39140 with 2 birds and 45460 with 3 birds.